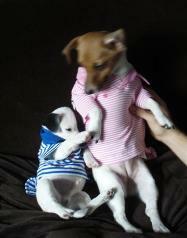 Jack russell terrier contact form. Please fill out and send to me. I will promptly follow up with our Personal Telephone Interview. This will give us the chance to talk one on one. Please leave a message, if I am unavailable at the time of your call. I check my voice mail frequently through out the day.